CHICAGO, IL--(Marketwire - Jan 27, 2012) - Baltimore Ravens linebacker Terrell Suggs and Dallas Cowboys linebacker DeMarcus Ware were named co-winners of the fourth annual professional Butkus Award®, honoring the best linebackers. It is the second such honor for Ware, who won the first ever professional Butkus Award in 2008. The Awards will be announced formally on a special broadcast of Pro Football Weekly the weekend of January 27-29 on Comcast and Fox Sports Network (check local listings). Suggs and Ware both received 46 points and 10 first place votes from the panel of 51 coaches, recruiters, scouts and journalists, coordinated by Pro Football Weekly. Meanwhile, rookie Von Miller of the Denver Broncos finished third with 14 points, after having won the collegiate Butkus Award in 2010 while at Texas A&M University. NaVorro Bowman of the San Francisco 49ers and Derrick Johnson of the Kansas City Chiefs finished fourth and fifth, with 10 points. Six other players received votes, including 2010 winner Clay Matthews of the Green Bay Packers and 2009 winner Patrick Willis of the San Francisco 49ers. "Suggs and Ware excelled at beating their blockers and terrorizing quarterbacks," said Hub Arkush, editor of Pro Football Weekly. "Terrell Suggs had his best year in 2011 of his nine years in the NFL, especially against the run. He understands blocking angles as well as anyone, and has been one of the most consistent pass rushers during his career. He really stepped up his dominant play when Ray Lewis had a late-season injury. 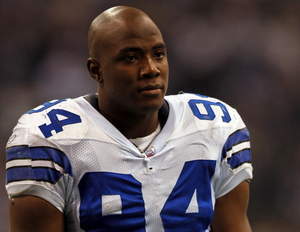 "DeMarcus Ware is the best pure pass rusher in football. He is a persistent and dominating defensive player, and overcame an off-season foot surgery to regain his speed and explosion during 2011." Considered one of the greatest football players in history, Butkus was inducted into the Pro Football Hall of Fame in 1979, following an illustrious career with the Chicago Bears, University of Illinois and Chicago Vocational School. Meanwhile, his son Matt was a defensive lineman for the University of Southern California, and joins his father in philanthropic efforts. Friend him at www.facebook.com/51.butkus. 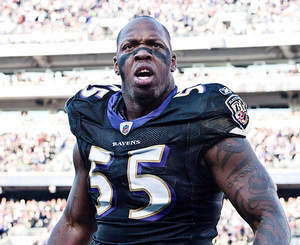 Terrell Suggs selected as co-winner of 2011 Professional Butkus Award, given to the country's best linebacker.